John Lewis Partnership has announced plans for deep decarbonisation targets in line with a 1.5C climate change trajectory, including a pledge to have a carbon-free transport fleet by 2045. The announcement is part of the Partnership’s new zero carbon strategy, which will see the company reduce its operational greenhouse gas emissions to net zero by 2050 at the latest. John Lewis & Partners and Waitrose and Partners operate over 3,200 delivery trucks, trailers and vans in total. Last year, the Partnership announced plans to switch its heavy trucks to biomethane. Transport emissions currently contribute over 40% to the company’s overall carbon footprint. The Partnership plans to initially focus on reducing HGV emissions, which account for over two thirds of its transport emissions. To achieve this, John Lewis has pledged to switch over 500 of its heavy delivery trucks to biomethane. Over 60 biomethane trucks have already been purchased. As the UK’s electric vehicle infrastructure improves over the coming decades, the Partnership says it will switch its heavy trucks to electric vehicles, along with all smaller vehicles. Some of its van fleet has already been electrified. The Partnership is working with technology company Arrival to trial four smart electric home delivery vans. 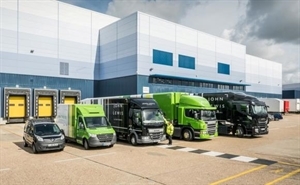 Six Waitrose and Partners delivery trucks are also currently trialling zero-emissions refrigeration units as part of the Low Emissions Freight and Logistics Trial (LEFT). Justin Laney, Partner and General Manager of Central Transport at John Lewis Partnership - and a LowCVP Board member - said: “We have been working hard to reduce emissions from our transport fleet over the last few years and are proud to set our most ambitious target yet. Business minister Claire Perry welcomed the announcement saying (reported by Business Green) she was "incredibly impressed with the role John Lewis Partnership is playing in tackling the vital challenge of climate change. She added: "Building on their pledge from Green GB Week, it's fantastic to see the work that's being done to reduce emissions from shops and buildings by committing to reduce energy use by a quarter and ensuring electricity across all sites will be 100 per cent renewable and British-sourced by 2028." Her comments were echoed by Nick Molho, executive director of the Aldersgate Group, who hailed the new targets as an example of "true corporate leadership on the environment". "It's important for two reasons," he said. "First, because it sets an ambitious objective to become carbon neutral in line with climate science. Second, because this target is backed up by a comprehensive and credible range of actions across transport, energy efficiency, renewable power and a phase out of HFCs in refrigeration units. This ambitious and coherent approach to eliminating carbon emissions is exactly the kind of approach government should be promoting to achieve net zero emissions economy-wide."